Yes, that is a clam. Yes researchers are using them as batteries. Yes, that quip about the matrix and clam-Neo that is bubbling up into your temporal lobe is appropriate. While keeping a clam as “happy as a clam” might not necessitate a virtual world, they don’t really produce much electricity either. Researchers were able to siphon almost 29 millijoules over the course of an hour. This was enough to turn their electric motor one quarter of a turn. 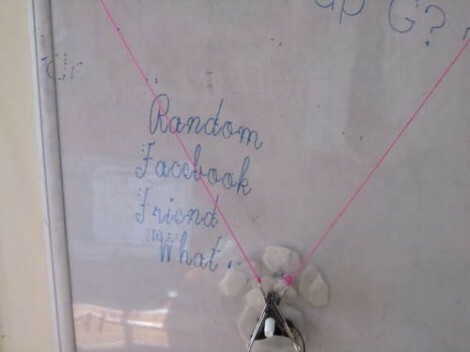 Wether you find this kind of biological hacking ethical or not, you’ll probably agree that the following quote is, at least a tiny bit, creepy. The researchers tried different ways to connect three clams at a time as a collective living battery. A serial circuit boosted the battery’s voltage (electric potential), whereas a parallel circuit increased the current (rate of charge flow) — but the overall electricity available often changed depending on each clam’s health. As you may recall, many of us here at Hackaday are big fans of any activity involving robot competitions. One of the better known events that fits that description would be the Robogames, an international event where robots can compete in 50 different events. Granted, not all of them are as visually exciting as the ball of fire and twisted steel shown above, but they are interesting nonetheless. The event is happening this weekend, April 20th, in San Mateo California. Unfortunately, none of the Hackaday staff will be able to make it this year, but we’re really looking forward to seeing all the cool pictures that seem to flow out of the event. If you happen to make it to the event, we’d love to see your pictures and videos. Join us after the break for a short video that gives a taste of what the games are like. When [Bobo1on1] upgraded his Internet connection from ADSL to Fiber he ran into an issue of actually getting that speed to his desktop computer though his LAN setup. Before he had been using a telephone extension wire which ran from where the DSL entered the house, through a splitter, to his computer where the modem was located. 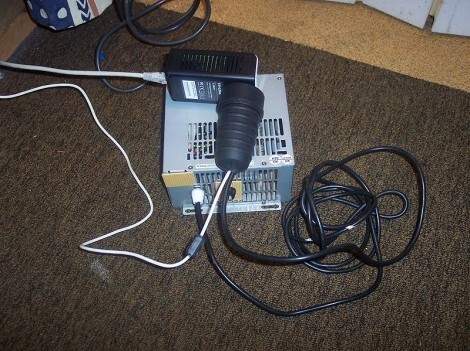 Now that the router used by the fiber system is located at teh entry point, he has no easy way to run Ethernet cable to his computer room. Wifi is predictably slower than the 50mbit WAN connection, and he was unable to use the telephone cable as Ethernet directly. The solution turns out to be a pair of TP-Link home plug adapters. These are designed to use your home’s mains wiring for data transfer. But [Bob] rigged it up so that they can push 224 mbits/sec over the telephone wire. Since you can’t run mains voltage through the telephone wire he had to hack a method to separate power for the devices from the data I/O. This was done with an external power supply and some passive components for filtering. The drawback is that this is half-duplex so up/down communications cannot happen at the same time. This auto-flute does it with steam. Well, electricity gets its piece of the action too as the tone holes are opened and closed using a set of solenoids. We’re at a loss on how the sound is actually produced. 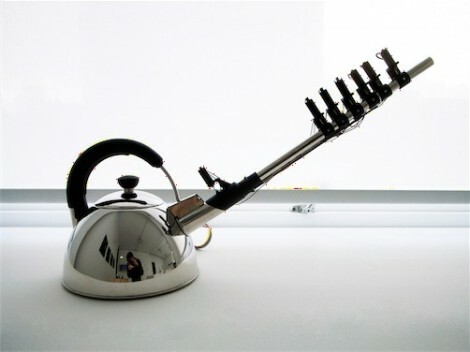 We would think that a penny whistle has been used here, except if that were the case the solenoid nearest the kettle would have no use. Then again, after watching the demo after the break we’re not sure that it does have much of an effect. It may be meant to stop the sound but it doesn’t really work all that well. At any rate we’d love to see some spin-off hacks. Assuming the plastic can stand up to the steam heat this would be a perfect robot controller for recorder controlled snake. You can get a recorder for a buck at the right dollar store, and solenoids can be made out of simple materials. If you know of a way to produce the sound yourself, all it takes are a few careful calculations to place the tone holes. 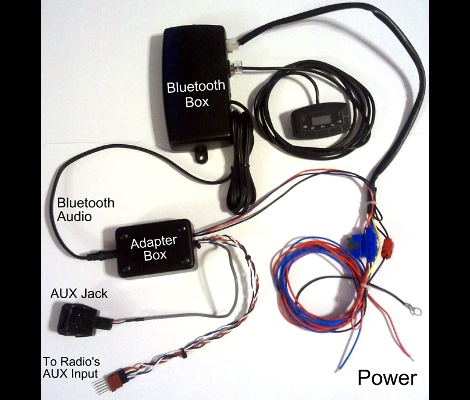 We’re rather impressed with the work [Aaron] did to add Bluetooth connectivity to his 2008 Honda. He used an aftermarket kit, but rolled in his own revisions to make it look and feel like an original feature. After being disappointed by an expensive docking system he grabbed a Jensen BT360 kit for about $35. It comes with an external speaker which would look horrid mounted on the dash. That speaker is meant to play your telephone audio via Bluetooth, while music from the phone is sent to the car stereo using an FM transmitter. Since he planned on hiding the control unit under the dash anyway, it wasn’t too hard to add some wires which intercept the audio being fed to that FM transmitter. From there he added a couple of relays to automatically route the audio signals (when present) and patched the whole thing into the Aux input. This way he doesn’t need the extra speaker, and all sound is feed to the head unit via wire instead of radio transmissions. The final setup works pretty well. If a phone call comes in it automatically mutes the volume, or pauses the iPod if that’s what’s currently playing through the Aux port. [Aaron] thinks the bass from music played via Bluetooth is not quite as rich as when using the Aux port, but if you don’t mind the cables that’s still an option too. [tinkartank] wrote in to tell us about the chess board step sequencer he built. 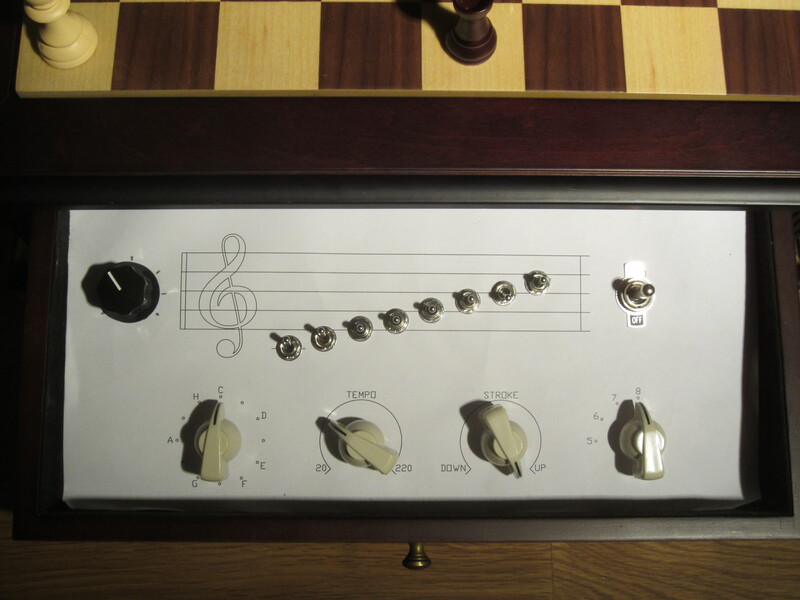 It’s a great piece of work that combines the wonderful classical erudition a set of chess pieces confers with modern technological musical equipment such as a monome. The build began by routing small holes underneath each square and fitting very small and fragile reed switches. Sixty four of these switches are wired into rows and columns then attached to the digital inputs of an Arduino Mega. To close these reed switches, magnets are implanted into the base of each chess piece so whenever a piece is on the board is moved a circuit closes. On the control side of things, [tinkartank] built a very nice control panel to change the key being played*, the tempo, an ‘arpeggio dial,’ number of steps, and if there is a whole or half step in between notes. With this control panel, [tinkartank] can play just about any scale. How does it sound? Well, the Arduino Mega outputs MIDI so realistically it can sound like anything imaginable. From the video demo (available after the break), we really like the interface and a reed switch array chess board is slowly climbing up our ‘to build’ list, if only for all the cool stuff you can do with one.